← Do we all do science? There is a lot of news about the assessment of experts on the feasibility of a manned mission to Mars. Sending humans to Mars by the 2030s is affordable, a group of experts finds, but some key changes are needed if it is going to happen. I remember as a boy in the 1970s reading that we’d be on Mars by the 1990s, as a college student in the 1980s hearing that we’d be there by the turn of the century, in the 1990s we would be there by… well now. Mars seems to be perpetually about 20 years in our future. So, I’ve become somewhat skeptical of claims that we will do it in 20 years. I’m scared that it’s more likely I’ll be sitting in my retirement home in 2035 reading that we should be there in the 2050s. That said, there are some reasons for optimism. After decades of wasting time with the space shuttle, we’re building a Space Launch System (albeit heavily criticized) that will finally give us something like the capabilities we had with the old Saturn V rockets. And the Orion spacecraft will provide a means to move manned exploration beyond low Earth orbit. If the next Presidential administration can just resist canceling and starting over again, there might be progress. Maybe. China has now successfully landed a rover on the Moon, and they are now talking about the possibility of a manned mission. Once they do land on the Moon, will they then be talking about the possibility of a Mars mission? If so, could this motivate the US, or the west in general, to suddenly exert real effort for Mars? It might, but this gets at another issue about our space program. Yes, we landed men on the Moon (now several decades ago), but it was a heroic stunt, a cold war propaganda initiative. We didn’t build any infrastructure, any bases, any colonies. We didn’t go to stay. We only went to collect a few rocks, take some pictures, and that was that, capitalism had beat communism to the Moon. Is that the way we want to go to Mars? If our motivation to go there stems from an international race, it seems like a possibility. Of course, getting to Mars is a much heavier lift than getting to the Moon, and it may well require an infrastructure this time to be successful. We didn’t do an infrastructure for the Moon because it would have been expensive. Very expensive. And there just wasn’t much of an economic incentive for spending that kind of money. I suspect that’s why the Mars mission languishes, stuck in this 20-years-in-the-future development hell. If we do have to develop an infrastructure, starting cold turkey with Mars is almost certainly a mistake. Here I was happy to see the group give a nod to bridge missions. The bridge mission could be anything from NASA’s ambitious plan to capture an asteroid and bring it into lunar orbit where astronauts could explore it, to a small and temporary station where astronauts can learn a little more about fending for themselves while in space. This all seems imminently sensible, although the bridge mission that would work best, building an infrastructure on the Moon, has been abandoned. This is a shame, because many of the issues we’d have to face with building a Moon infrastructure are the same issues we’d have to face on Mars. Of course, they’re not identical, but we’d have a lot better idea of the issues we faced with living on Mars if we had a Moon infrastructure under our belt. Many insist that we’ve already been to the moon and that there’s no reason to go back. But this strikes me as rationalizations for the current budget limitations. We currently can’t afford a lunar landing mechanism, so going back to the Moon is off the table. Indeed, we also don’t have a landing system in development for Mars. Landing, and taking off again, are among the most difficult aspects of these types of missions. Without money for landing mechanisms, we can go to these destinations, orbit them, maybe control robot explorers in real time, but that’s about it. It always seems to come back to budget limitations. And the budget limitations exist because we don’t have an economic motivation for manned space exploration. It’s all fine and well to talk about the spirit of exploration, but the explorations in the European Age of Discovery had strong economic motivations such as, initially, the spice trade and, later, the lure of usable land for colonies. The closest thing the space industry has to this is mining materials from asteroids. This could eventually be an economic incentive, but it’s still one with a huge initial investment. Going to Mars needs its own version of the spice trade. 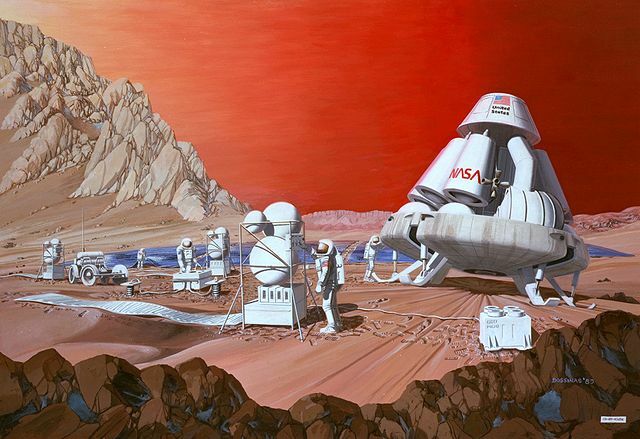 Until it has one, or unless space travel becomes much cheaper, manned Mars exploration may remain 20 years in the future. This entry was posted in Space and tagged Manned mission to Mars, Mars, Mission control center, Moon, Nasa, Orion, Science, Space, space exploration, Space Launch System. Bookmark the permalink. Space X wants to do it in 15 years. I have some confidence in this. I hope you’re right. I saw Elon Musk interviewed on CNN-GPS a few weeks ago. I was impressed by his candor, competency, and vision. I also like the look of Red Dragon. It might be a good landing system, although I’m skeptical of one way trip scenarios. Additionally, Laura Magdalene Eisenhower spoke about the secret base(s). There are other stories just as mind blowing regarding the secret societies of CIA like agencies for the New World. Of course, it can’t be. LOLS! I’m sure there’s an Ancient Aliens episode on this somewhere. maybe… I don’t watch many of the episodes. Interestingly though, you LOL and perhaps dismiss the idea that the future is a part of the now and therefore, its very possible that there is a base on Mars that was there 50 years ago although perhaps in a parallel sense not really there 50 years ago. You know I do enjoy your blog Mike. Eric, I sincerely apologize if I misread your comment. I took it as being in jest and replied to it in that spirit. I meant no disrespect and very much enjoy your visits. So more seriously, I can’t put any stock in these kinds of stories. Extraordinary claims should require incontrovertible and extraordinary evidence. Until I see that kind of evidence, it seems much more probable that the claims arise from confusion (or fraud). ah… I se. Actually, it is very fantastic and certainly there is not any evidence that we can share – and if there were there would be a tremendous outpouring of rebellious and bewildered masses on the street at the moment. I didn’t take it as disrespect at all though. It is outrageous even if true.